FDA regulations require a prescription to purchase this item. The SleepStyle™ 244 CPAP with Humidifier offers a comprehensive range of standard, enhanced and truly integrated CPAP devices with usage recording capability, SmartStick™ Technology and Auto-Altitude Adjustment. Versatile design delivers comfortable and effective therapy to cost effectively meet the changing needs of patients cost effectively. Innovative performance features promote better results in clinical effectiveness and patient care. The strongest differentiators in the SleepStyle™ 244 Series is the Ambient Tracking™ Plus auto-adjusting technology and SmartStick™ Technology. * compensate for changes in room temperature – minimizes condensation. * compensate for humidity loss during leaks – maximizes humidity. 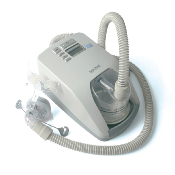 The overall result is effective CPAP therapy under changing conditions. The SleepStyle™ 244 CPAP with Humidifier offers SmartStick™ Technology along with a compliance metric and efficacy reporting. The SmartStick™ utilizes USB technology and provides convenient 2-way removable media to view and update settings. This SmartStick™ Technology combined with PerformanceMaximizer™ Software streamlines therapy analysis with options for compliance data with the SleepStyle™ 244 CPAP. * Performance monitoring through PerformanceMaximizer™ Software. * Two-way communication, including data transfer and remote adjustment of settings, via the SmartStick™. * USB Technology, readily available in most PCs. Has ComplianceMaximizer™ software for CPAP and humidifier usage and performance data reporting for clinicians and providers This version also includes efficacy (beneficial change or therapeutic effect) usage reporting. This software meets the insurance and Medicare compliance data reporting requirements. Automatic leak compensation will react to pressure drop due to small mask leaks to maintain prescribed pressure. SleepStyle™ 244 CPAP with Humidifier includes patient manual, 2 standard water chambers or 1 optional dishwasher safe chamber, connector, 6ft tubing, air filter, water funnel and carry bag.